The VEIIK Airo Pod Kit is a portable and exquisite pod system kit with PU sticked panels. The VEIIK Airo comes with built-in 360mAh battery, which can bring you durable vaping experience if fully charged. With the LED indicator light, it will be very convenient to know the battery status. And 2ml refillable VEIIK Airo Pod Cartridge adopts advanced bottom air driven system and organic cotton to bring you optimal flavor of nicotine. The VEIIK Airo features draw-activated switch, so you will vape it without any button. Just get this device for an on-the-go vape! The Starss Bravo Pod system is an ultra portable newly designed pod device. 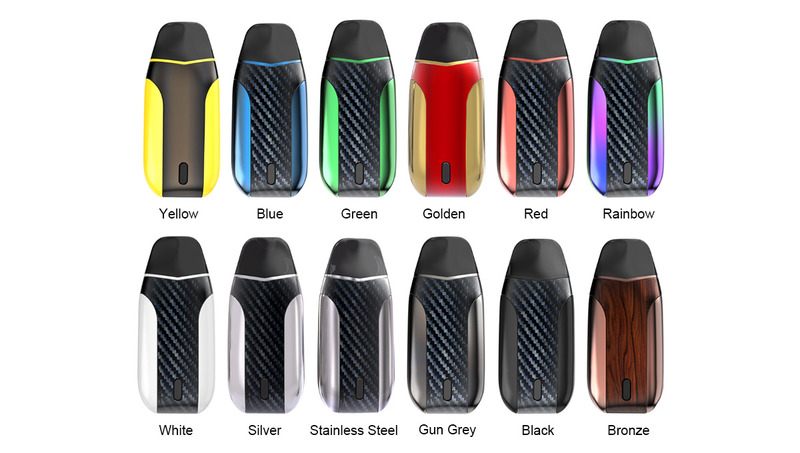 It has a very large battery capacity of 1000mAh with a built-in rechargeable lithium ion battery, which allows the Starss Bravo Pod to last all day and supports the maximum output power of 8W. The Starss Bravo pod device uses the refillable Bravo Cartridge System, which allows you to utilize up to 2mL of your favorite salt-based nicotine e-liquids or regular e-liquids. The Bravo pod has three output modes (low, middle and high), indicated by red, green, and blue LEDs. The Starss Bravo utilizes an air-driven system for button-free and draw-activated firing. Replacement cartridge resistance is 1.2ohm, utilizing the newest designed ceramic coil technology to ensure the purest flavor without the fear of burning coils. Located at the bottom of the cartridge is a flip-top silicone stopper for easy refill.